1. It has to make me laugh spontaneously and despite myself. 2. I have to be aware at the time that I shouldn't be laughing, or have later events shock me in a not so funny now then, eh? kind of way. Tonight's show rarely, if ever, met those criteria. And more than that, I found it quite uncomfortable to be in an audience who appeared to be laughing guilt-free at much of the dark humour without any acknowledgement of the inappropriate edge to it. At one point it did look as if we were heading for a not so funny now ending but in opting for a conveniently comfortable conclusion the play, in my opinion, 'bottled it'. 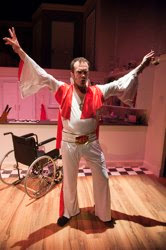 And I'm afraid that despite an excellent performance from Gavin Mitchell as Dad the Elvis moments didn't really work for me - well not in the context of the rest of the play at any rate - although to be fair to the piece, surreal stuff rarely works for me. Jayd Johnson as fifteen year old Jill gives a confident central performance in both the comic and emotional scenes and Deirdre Davis and Martin Docherty complete a strong cast as Jill's Mum and her lover Stuart. Despite the performances, a fantastic set, Elvis soundtrack and a razzamatazz finish the show feels a let down. It lacks the sharp, clever humour to get me laughing at things I know I shouldn't be and didn't deliver the powerful kick in the stomach it should have been capable of doing. And disappointingly many of the 'twists' and moments of farce were predictable from very early on.